Out of doors the landscape contains treasures of its own. 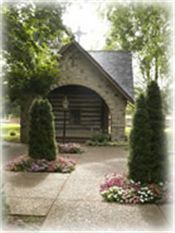 Near "Bishop Rosati's log cabin," one of the original structures at the Barrens, is a path leading around the seminary grounds and along a densely shaded walk lined with maple trees. At its southern end is a magnificent mound covered with myrtle and surrounded by a circle of ancient boxwood and native Missouri Red Cedar. The mound is topped by a statue of our Lady of Victory. The path from the mound leads to a grotto in honor of our Lady of the Miraculous Medal. The Grotto of our Lady of the Miraculous Medal was built by the seminarians during World War I. It has become a special center of devotion to our Blessed Mother since then. Construction began in 1917 and was completed in November 1920. The first stone was put into place on June 25, 1917. A small chapel recessed in the center of the grotto wall has a small altar made of fieldstone. In a small niche at the top of the grotto wall, directly above the small chapel, is a statue of our Lady of the Miraculous Medal. The statue of our Lady arrived August 5, 1920. The grotto stands at the site of the old quarry, behind the M ound of our Lady of Victory (originally known as "The Mound of Our Lady of the Fields"). Rock used to build historic SaintMary's of the Barrens Church came from this site. When the last stone was in place and the landscaping all finished, Archbishop Glennon dedicated the grotto on November 11, 1920. Priests, brothers, and seminarians of Saint Mary's, helped by local laborers, worked three years to complete the grotto project. The entire construction is documented in an old seminary journal. The journal mentions that documents were buried in the grotto with the names of the workers and those at Saint Mary's Seminary.